18 JULY 2018. Is it time for a legal definition of veganism? In 2011, the European Commission was mandated to form a definition of vegetarian and vegan food. Last year it stated it would begin preparatory work on this in 2019. 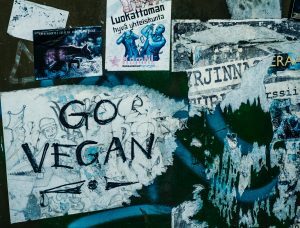 The worldwide increase in the number of people calling themselves vegans has led to a growing realisation of the challenges vegans might face within societies where they nevertheless remain a minority. In the light of this, the APPG wished to apply itself in particular to how a legal definition of ‘vegan’ might ensure a broad understanding of what veganism means for vegans, non vegans, organisations and companies. It aimed to highlight what advantages and disadvantages this might bring. Two aspects of this were under discussion: 1) legal protection of a vegan’s right, as granted to other citizens, to live a certain lifestyle and 2) an understanding between manufacturers, suppliers and vegan consumers of what it means to say that products are ‘vegan’. First speaker was Dr Jeanette Rowley, founder of the ‘International Vegan Rights Alliance’, a global network of vegan legal professionals applying human rights and equality law to assist vegan claims. She set out the current situation. Vegans are protected by Article 9 of The Human Rights Act 1998. This grants the right to practice freedom of religion and belief. Within the UK this is interpreted as including vegans, as acting from ethical convictions. As such they have protected status, whereby vegans’ needs should not be ignored and they should not be forced to act against their ethics under a dominant anthropocentric regime. Such interference could be interpreted as unlawful coercion e.g. where a vegan police officer is not allowed to use vegan shoes, or where children are being made to dissect animals in school. However, such a right must be cogent, serious and worthy of respect within a democracy. Thus legal challenges to the ban on fox hunting in the UK (Hunting Act 2004) under the Human Rights Act failed in 2009. The UK Equality Act 2010 similarly protects beliefs whether religious or non religious. In using both these Acts, it is possible to support legal claims of those who wish to live a vegan lifestyle. The benefits from the Human Rights Act will remain after Brexit, as the provisions are part of the United Nations International Bill of Human Rights, to which as signatory, the UK will remain subject. Dr Rowley then addressed the question of whether a legal definition of veganism is needed. She referred to the multiple voices within veganism. Motivation and commitment may differ in terms of whether based upon compassion, ethics, human health or sustainability. Some may be vegan in diet only, vegan for one day a week or take on a total vegan lifestyle. In her view, a legal definition of what is a vegan may be too restrictive to cover all of these and lead to failure in the courts. Thus a more successful approach within the UK is to continue to depend upon the Human Rights and Equality Acts under which vegans can already be viewed as having protected status. Arguments on ideas of belief, identity, duty, compassion and justice can then be used for protection of vegans and thereby for the good of non human animals. While this approach may be effective in the UK, there are variations in other countries as to how the Human Rights Act is interpreted. Edwina Bowles is a solicitor and an A-Law Trustee. A-Law’s aim is to promote knowledge and understanding of animal protection law. QCA was one of the named organisations which supported A-Law’s recent report (co-authored with Wildlife and Countryside Link), “Brexit: Getting the Best Deal for Animals” (download). Edwina Bowles presented a quick overview of the Animal Welfare Act 2006 reflecting the concerns of vegans and vegetarians. She stated that the UK had gone beyond the EU in animal welfare provision, and the Animal Welfare Act is capable of being extended to invertebrates and sea animals. We have an obligation under the Act toward both animals both under human control and in the wild state, not to cause unnecessary suffering by any act or omission. However, if deemed legitimate and proportionate, then the suffering is not considered unnecessary. To illustrate, Section 5 of the Act forbids mutilation, the exception being in farm animals where, for example, pig tails may be docked if they are biting each other due to unusually stressful conditions/overcrowding. Enforcement is mostly inadequate and failings are found in many farms. 70% of pig farms dock pig tails routinely; there is too high a density of chickens; sow stalls (banned in 1999 in the UK) still exist; calves are taken from their mothers too early and so on. The Vegan Society gives a descriptive definition of “veganism”. Would a legal definition be helpful in labeling products? The Vegan Society’s trademark team explained their endorsement system. Permission to display their logo is granted after a great deal of research to avoid all exploitation of animals within the bounds of what is possible and practicable. The practicalities of relating this to a legal definition would be difficult. The challenge would be to follow progress in manufacturing technology and to keep up with issues of sourcing, supply chains, animal testing, use of packaging, transport and cross contamination. Because there is no legal definition of ‘vegan’ in Europe, the United States or elsewhere, any supplier can put a vegan label on a product. This would therefore demonstrate the need for some legal definition that the consumer can rely upon. A firm definition today would also need to stand with the technological advances in the future. The Vegan Society has been working with the EU on this for the last 10 years and it is hoped that labeling within Europe will be in line with their input. Vegan Society Trademark Standards can be viewed here. Questions from the floor included the claims of infringement as regards the new bank notes, which vegans are unable to avoid. Should it be compulsory to label as vegan those foods are not but which do not appear to contain animal products? Conversely, where foods are labelled by manufacturers as vegan, can this labeling be trusted? Will it need involvement of Food Standards Agency and Trading Standards? Such questions will continue to arise as the number of vegans rises internationally. The European Vegetarian Union (EVU) was formed in 1996 as an umbrella organisation aiming to bring clarity and transparency to vegetarian and vegan products. It has registered its “V” sign in 27 countries including the UK and has been lobbying the EC to give priority to this issue. Information on its labeling can be read here. The EVU’s view is that it is impossible to avoid all traces of animal substances in products. Zero tolerance would lead to no products being labelled as vegan. For instance, insects may be found in fruits, vegetables and cereals and may be killed during processing. Other forms of food labeling such as organic or non GM allow for a certain percentage of contamination. In Germany, the results of a 2016 working group supports this view, stating that the unintentional presence of animal substances should not be regarded as misleading even from an allergy point of view. Further it declares that accidental cross contamination eg where plant foods are processed/manufactured using the same machinery as animal products is not an ethical problem as it doesn’t lead to increased use or death of animals. In the US, a lack of a legal definition of vegan or cruelty-free means that manufacturers have to create their own labeling strategies. A really difficult one. Organisations such as FDA can’t be seen to let anything new go to consumers without animal testing. Have other vegan foods been tested in this way, without companies having the honesty to mention it ? Anything processed will likely have to undergo some type of testing. All the more reason (as well as for health) to try and eat as much fresh food as possible. How much accommodation is each of us willing to make? I guess for meat eaters wanting to cut down this will not be a dilemma. Impossible Foods says “the greater good is more important to us than ideological purity.” For me, it isn’t ideology. It is emotional. Associating the product with what goes on in animal testing turns me off. Can I eat something when I can see in my mind the rats who have been and will be used should a new product come to market? Does anyone else have an answer? Recent examples from L’Oreal illustrate the difficulties caused by the lack of a legal definition of vegan. L’Oreal marketed a new range of shampoo as ‘100% vegan’ This caused criticism from vegans who felt this claim could not be justified. Another new range has the labelling “Vegan formula – no animal derived ingredients”. The challenge is that although there are no animal substances within the product, some vegans will not accept the product due to L’Oreal’s association with animal testing. What does or does not the label vegan allow? What are the boundaries ?